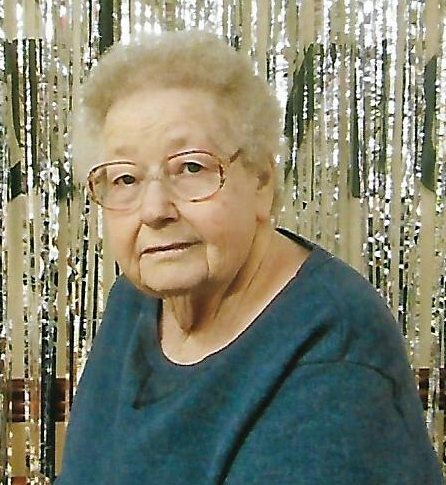 Blanche Green, 87, of Conrad, passed away peacefully on the evening of Monday, April 9th, at the Oakview Nursing Home in Conrad. Funeral services will be held at 1:30 p.m. on Friday, April 13, 2018, at the Mitchell Family Funeral Home in Marshalltown, Iowa with Pastor Bobby Shomo officiating. She will be laid to rest in the Conrad Cemetery. Visitation will be held from 6:00 – 8:00 p.m. on Thursday, April 12, 2018, at Mitchell Family Funeral Home where her family will be present to greet friends. Memorial contributions may be directed in Blanche’s name to her family. For condolences, please visit www.mitchellfh.com. Ph. 641-844-1234. Born on February 23rd, 1931, in Illinois, she was the daughter of Paul and Marian (Strong) Conrad. She received her education in the area of her birth and in Minnesota. On January 9th, 1950, she was united in marriage to Edward E. Green in Northwood, IA. They made their home in the Whitten and Conrad rural communities and then into the town of Conrad. She enjoyed camping, children and treasured her family. She will be greatly missed by her daughter Susan (Floyd) Hills, of Conrad, two grandchildren: Robert (Bobbi) Hills and Kristine (John) Wiegand; seven great-grandchildren: Brittany (Ryan) Medina, Brenden Hills (Kailey Balducki), Justin Fisher, Malori (Dylan) Martens, Lindsay Wiegand (Tyler Cramer), Raymond Wiegand and Ashly Wiegand; one very special great-great grandson; Rafael Hansolo Medina. Also surviving her are her brothers Lawrence Wayne Conrad and Clifford Lee Conrad both in Illinois. In death, Blanche rejoined her beloved husband Edward who died in 1987; her parents, brothers Bill and Bob Conrad and sisters Stella Mae Conrad and Helen Curley.